Professor Sioned Davies (BA 1976) Professor, translator and former Head of Cardiff University’s School of Welsh. “I never intended to study Welsh. I arrived at Cardiff University in 1973; I had been accepted to do joint honours in French and German. But I was persuaded to take Welsh as a third subject. It seemed inconsequential at the time, but I haven’t looked back since. “Coming to Cardiff was very exciting for a girl brought up in rural mid-Wales. Under Miss Howe’s eagle eye in Aberdare Hall, I quickly made lifelong friends and settled into student life, from wild Saturday nights in Mont Merence, Tito’s and Qui Qui’s to the more sedate 9 o’clock lectures on the Latin element in the Welsh language. I even risked the Welsh Department’s wrath when I sneaked off to Paris, to watch Wales play – and beat – France at rugby. “After graduating, I spent three years at Oxford. But Cardiff lured me back; I’ve been here lecturing since 1979 – that’s testimony in itself to the appeal of what has blossomed into a vibrant, cosmopolitan city. “Much has changed. I’ve worked under five Vice Chancellors, been Assistant Dean of a Faculty of Arts and Social Sciences, and seen the School of Welsh adapt to the changing demands of the 21st century. “Most recently, the development of the Welsh for All programme has enabled hundreds of students, both home and international, to learn Welsh at Cardiff. 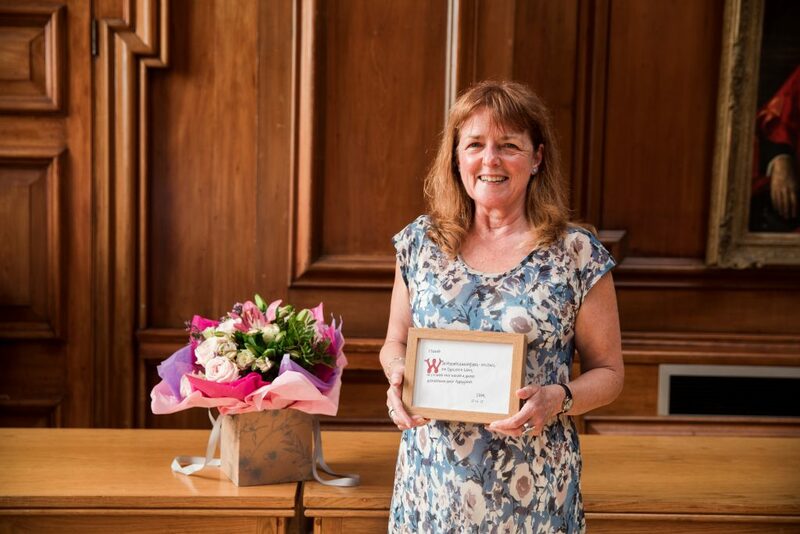 “The enthusiasm and dedication of the staff – each one willing to go the extra mile to support students and each other – mean it has been a real privilege to lead the School for over 20 years. “I intend to return to lecture, but now I have a year’s study leave to continue my work on the tales of the Mabinogion. Among other things I’ll be examining how these stories were re-created, with illustrations, for 19th and early 20th century audiences.